Los Angeles (April 2016)—Arbor Realty Capital Advisors has announced the completion of the sale of 888 Devon Avenue in Westwood to a partnership led by Galvic Construction for an undisclosed sum. The transaction is notable in that it involves one of the last unimproved parcels along Wilshire Boulevard’s Golden Mile. Arbor’s Managing Partners Joshua Levy and Matthew Dobson exclusively represented the sellers, Hill Street Realty and Salem Partners, along with securing the buyer. 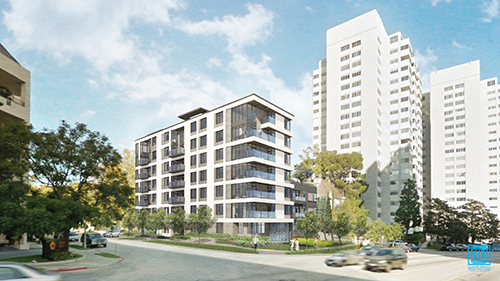 A Partnership led by Los Angeles-based Galvic Construction plans to develop the entitled site at the northeast corner of Devon Avenue and Wilshire Boulevard according to the approved plans, which includes 26 residential units in one mid-rise building with subterranean parking. The project, which will incorporate extensive outdoor living space along with green building techniques, was purchased fully entitled and construction is expected to start in early 2017. “The site is irreplaceable and the project design is world class," said Joseph Penner founder of Hill Street Realty, “and the partnership with Salem Partners was integral in executing this complicated transaction”. “We have come to expect a high level of service working with Arbor and they delivered for us again”. Located near Westwood Village, Century City and Beverly Hills, the property is centrally located and is situated amongst some of the most expensive and desirable real estate in the world. Hill Street Realty is a full service real estate firm located in Los Angeles. Salem Partners is an investment banking and wealth management firm located in Los Angeles. Arbor Realty Capital Advisors provides high level, client centered commercial real estate services to institutional, corporate, and high net worth individuals at local, regional, and national levels. Headquartered in Pasadena, CA, Arbor, through its nationwide network, seamlessly executes on behalf of owners, tenants, investors, and developers throughout the country. For further information, visit www.arcainc.us.